Astronomy magazine called this scope’s predecessor, the 66mm Astro-Tech AT66ED, “a product everyone should own." The new Astro-Tech AT72ED upgrades that best-selling predecessor by increasing the aperture to 72mm to give you 9% higher resolution and 19% more light gathering; upgrades the focuser to 2", with a 1.25" adapter; and increases the focuser travel to 80mm to allow imaging with a wider variety of camera types.Astronomy said the AT66ED was “a great grab-and-go scope, a fine little astrograph, a super-finder scope, and a daytime spotting scope." The same is equally true for the new AT72ED. The images from the 430mm f/6 ED air-spaced doublet optics of this Astro-Tech AT72ED refractor are virtually free from spurious color (chromatic aberration), even at high magnifications. At its low price, the optical performance is little short of astonishing. The exceptional AT72ED optics are even more impressive when you consider the package they come in. The finely-machined scope has a dual speed 2" Crayford-style focuser with a microfine 10:1 fine-focusing ratio. You can rotate the focuser a full 360° to put your eyepiece or camera in the most comfortable observing position. The supplied 2" and 1.25" eyepiece adapters use non-marring brass compression rings that won’t scratch your eyepiece and accessory barrels. The Astro-Tech AT72ED has a retractable lens shade and comes in a locking aluminum-frame hard carrying case. This 12" long refractor optical tube (14.5" long with the lens shade extended) has the right balance of aperture and focal length to use as a low-power rich field telescope, as a medium-power planetary telescope, or as any kind of telescope in between. Its compact size, light weight, and convenient removable L-shaped mounting foot that mounts on any photographic tripod also make it an excellent terrestrial spotting scope for vacations, birding, or nature studies. In addition, optional camera adapters turn the AT72ED into a superb 430mm (8.6x) f/6 daytime telephoto lens and nighttime wide-field astrograph, as can be seen in the feature image below. The tripod mounting foot is also a dovetail adapter that fits directly into the dovetail slot on the top of many altazimuth and German equatorial mounts, such as those from Astro-Tech, Celestron, Meade, and Vixen. The AT72 image of M31, the Andromeda Galaxy, shown in the feature image section below is by Tibor Mihalovits. He was happy to share the image with us because, as he said, “I'm at the very beginning on my astrophotography adventure and it is a good example for people trying to start out to see what the AT72ED can do with an unmodified Canon EOS Rebel T1i DSLR camera in 90 minutes. With the AT72ED, you don't have to spend $5000 on a single scope to get something nice! Since I got the AT72ED, I've been recommending it on the Cloudy Nights imaging forum a lot for the guys that want to start out. You just can't beat that scope, price, quality, aperture. My next imaging scope will be an A-T scope also! Thank you!" 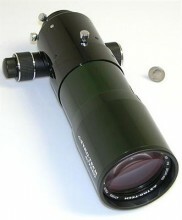 ED doublet refractor optics: 72mm (2.83") aperture, 430mm focal length, f/6 focal ratio air-spaced doublet lens using premium Ohara glass from Japan, including an ED (Extra-low Dispersion glass) element to reduce spurious color halos and fringing to vanishingly low levels. While we do not claim fully apochromatic performance in the class of a multiple thousand dollar Takahashi, Astro-Physics, or TMB refractor, the AT72ED is so free from spurious color as to be virtually indistinguishable from an apochromatic system. And, as Mr. Spock probably said in one episode of Star Trek or another, “Any difference that makes no difference, is no difference." Multicoated optics: The objective lens has the latest state-of-the-art broadband antireflection multicoatings on all four air-to-glass surfaces for high light transmission and excellent contrast. This can easily be seen by looking into the objective lens of the scope. Virtually no reflection of your face will be seen. It’s a sure sign that the high transmission coatings are doing their job, by letting virtually all the light enter the scope, rather than reflecting some light back to your eye. Internal light baffles: There are three contrast-enhancing knife edge baffles inside the optical tube, and anti-reflection threading the full length of the focuser drawtube, for truly dark sky backgrounds and high terrestrial contrast. In addition, the edges of the objective lens are blackened to eliminate contrast-reducing stray internal reflections. Full power range capability: The “highest useful magnification" listed above right is 143x. This is the power obtained with a 3mm eyepiece, which provides an exit pupil of 0.5mm (about 1/50th of an inch) and 51x per inch of aperture. This is generally the smallest exit pupil recommended with any telescope before the images start to become too dim to be consistently useful. Higher powers are possible for lunar and planetary observing, however, given excellent seeing conditions, although the increasing dimness of the image will start to limit the performance on all but the brightest objects. The lowest useful power is 11x, achieved with a 40mm eyepiece (a 40mm 1.25" TeleVue Plössl will give you a 4.2° field at that power; while a 2" Astro-Tech 40mm Titan Type II ED will give you a 6.33° field). At 3.8x per inch of aperture, this is very close to the 4x per inch of aperture generally regarded as the lowest practical power with any telescope. A 40mm eyepiece on the AT72ED will give you a 6.67mm exit pupil, larger than most eyes can dilate. Any lower power would simply waste some of the scope’s light gathering capacity, as its collected light would fall on your iris, rather than entering your eye. Dew shield: A self-storing retractable dew shield slows the formation of dew on the lens in cold weather to extend your undisturbed observing time. It also improves the contrast, similar to the effect of the lens shade on a camera lens, when observing during the day or when there is excessive ambient light at night, such as a neighbor’s backyard security light. Dual speed microfine 2" Crayford focuser with 1.25" adapter: The precision-made 2" focuser has dual-speed focusing. There are two coarse focusing knobs. The right knob also has a smaller concentric knob with 10:1 ratio reduction gear microfine focusing. This provides exceptionally precise image control during high power visual observing or critical DSLR or CCD imaging. The focus knobs have knurled rubber and ribbed gripping surfaces so they are easy to operate, even while wearing gloves or mittens in cold weather. The 80mm (3.15") travel focuser drawtube has a scale marked in 1mm increments so you can note individual focuser positions for easy return to the correct focus when switching between visual use and photography. A lock knob under the focuser lets you lock in your photographic focus. The focuser drawtube terminates in a 2" compression ring accessory holder to accept a 2" star diagonal and 2" photo accessories. A lock knob on the top of the scope allows the focuser to be rotated a full 360°. This lets you rotate the focuser to line up a camera in either a landscape or portrait orientation (or any orientation in between), as well as put a star diagonal and eyepiece into the most comfortable observing position, and then temporarily lock the focuser in that position. The supplied 1.25" accessory adapter slips onto the 2" accessory holder and uses a soft brass compression ring to hold 1.25" star diagonals and photo/visual accessories in place. The 1.25" and 2" compression rings won’t scratch the barrels of your star diagonal or accessories as an ordinary thumbscrew can. Combined equatorial dovetail/tripod adapter: The AT72ED has a removable L-shaped dovetail mounting foot/tripod adapter. The 1.75" wide x 3.25" long mounting foot is sized and shaped (with slanted sides) to fit the Vixen-style dovetail slot on the head of many altazimuth and equatorial mounts. It will fit, without modification, the Astro-Tech Voyager altazimuth mount and the Celestron CG-5 and Advanced Series, Meade LXD-75, and Vixen Great Polaris German equatorial mounts, among others. In addition, the mounting shoe has two 1/4"-20 thread mounting holes that allow it to be installed on any camera tripod that has a standard 1/4"-20 thread mounting bolt. You can choose the mounting hole that provides the best balance when used with your particular combination of star diagonal, eyepiece, and/or camera. Cork pads on the underside of the mounting shoe help keep the scope from swiveling when mounted on a photo tripod. The dovetail is removable to allow the AT72 to be used with optional guidescope rings as a photoguide for a larger telescope. Tube finish: The optical tube and dew shield is anodized in a dark forest green, with anodized black trim and a black anodized focuser. Other supplied accessories: A slip-on metal dust cap is standard. Two threaded holes for installing a finderscope mounting bracket are located on the upper left side of the scope body. One hole keeps the finder in a fixed position relative to the scope’s mounting foot, regardless of how the focuser is rotated. The other rotates with the focuser, keeping the finder in the same position relative to the focus knobs, again no matter how the focuser is rotated. Shipping/storage case: The scope comes in a 15.5" x 10" x 7.5" aluminum-frame locking hard case with carry handle. The foam-fitted case has cutouts for the scope, a 1.25" or 2" star diagonal, and up to three eyepieces (two 1.25" and one 2"). Astro-Tech is one of the very few manufacturers to provide a case at no charge for protection during shipping and as a storage convenience when the scope is not in use. Unfortunately, FedEx, UPS, and the Postal Service are very good at treating packages roughly. Occasionally, your scope can arrive in perfect condition, but with the walls of the shipping case dented in transit from rough handling, or the aluminum frame sprung, rendering the appearance of the case less than pristine. Damage to the shipping/storage case in such instances is not covered by warranty. Two year warranty: As an expression of the confidence Astronomy Technologies has in the quality of their products, the Astro-Tech AT72ED is protected by a two-year limited warranty against flaws in materials and workmanship (shipping case excluded). Click the button below to add the Astro-Tech AT72ED 72mm f/6 ED doublet refractor, green and black tube to your wish list.